Excellent film - Highly recommended - 5 stars - do I make my point? This film is amazing; full of action; full of exciting, ironic twists; and reminds a person of the book 1948. Scary though in that it is a mirror of what the recent Department of Homeland Security report said -- anyone not agreeing with the current government is a danger to society. The original report (as of recent the websites I have seen are watering it down after public outcry - or putting their own words in it to make the position of the document seem less offensive) labels these people as terrorists - read it! It is there in black and white! The report specifically mentions veterans as being potential terrorists! Again - try to find the original copy online - recently the websites are watering it down after public outcry. In Equilibrium, the personal thoughts and opinions of the individual are seen as a threat to the government head - called "The Father." This leads to the imprisonment of those who do not agree with the established system. Equilibrium presents us with a fictional society where emotion (hence private opinion as to what is best) is required to be sacrificed by individuals for the (government defined) public good. This film is a fictional, but harsh glimpse at what history has proven socialism always evolves into. The reason history has absolutely no record of a non-evil socialistic society is shown in portrayed here. Mankind has an inherent sense of greed and selfishness. Therefore, when an authoritative figure is set up to become the entity to distribute everyone's private goods among all society (socialism) - for a state of equilibrium - the fact that, "absolute power corrupts absolutely" rears its ugly head. The "father" in this film is so very typical of what "absolute corruption" results in: the "Father" forces his opinions on the masses, and (as in all recorded, historical instances) - allows only himself (and immediate friends) the very privileges he denies the citizens! The parallelism of this film - although a fictional world not yet existing - to historical accuracy is an amazing parallel to witness. Equilibrium also accurately defines the human emotions of greed and selfishness to be the cause of war. However, as seen here, these - always- are also the basis of evil regimes that kill their own citizens! What a paradox! This film accurately does show the way to combat these evils is NOT to sacrifice the rights of the individual and "spread the wealth around" b/c when individuality is lost, then existence becomes nothing but a play-toy for the few who wield the authority. The citizens become puppets living only gratify the indulgences of the privileged few. On the plus side, there's some decent cinemetography, and sets were great. I especially liked the forced juxtaposition of drab, monotonous sets with brightly colored ones, which was especially effective in underscoring the film's theme. As for the negative: the plot was painfully predictable -- especially if you even have a passing familiarity with 1984, Brave New World, etc. I called all but one plot point within the first 20 minutes. The script/dialogue was also hum-drum with little "good" dialogue, though the case could be made for that being intentional given the forced-emotionless milieu. I would also consider the fight sequences to be a negative, though they actually deserve their own paragraph. Although I can see how they would be a big appeal of the film -- admittedly they were well done/choreographed within their context -- but in all honesty, I found them out of place. Having super-human moves like these make sense only within context: similar effects in The Matrix or Crouching Tiger Hidden Dragon are okay because those are by definition other-worldly (a computer sim and a fantasy setting, respectively.) That is brazenly NOT the case with Equilibrium, and we are supposed to believe that someone can dodge bullets simply because of a little study on the subject. Sorry, but that's just too much suspension of disbelief for me, especially since this film otherwise purports to be grounded in "reality." This is an interesting movie to stumble across while channel surfing but not a DVD to rent or own. What can you say about a movie where the hero slaughters hundreds of people but can't save his wife or (later) his love interest from being burned to death and yet manages to rescue a cute puppy. This not so much a science fiction move about a futuristic "Orwellian Dystopia" as it is a is a recipe of how to make a science fiction movie about a futuristic "Orwellian Dystopia." Viewing this movie was kind of like playing Trivial Pursuit. It was more enjoyable trying to pick out the various ingredients in the recipe than actually watching the movie. Top with a maraschino cherry of a happy ending (visually like the one in Fight Club) and you have Equilibrium. The basic premise of the film is that after an apocalyptic war, all humanity is ruled by a single government in which a Big Brother figure maintains total thought control and conformity. In order to prevent conflict, all feelings and sensations are suppressed by constant monitoring and drug injections. People who violate the dictated norm are hunted down by "clerics" and eliminated by incineration. Christian Bales character is one of the "clerics." He is a single father of two whose wife has been incinerated. He's a top cleric but as the film progresses he begins to have doubts about what he's doing. Ultimately, he seeks out the resistance leaders of the "underground" who are, literally, underground, forced to live in secret room filled with a clutter of paintings, books, old toys and bric a brac (not unlike a modern teenager's bedroom). Inspired by a young woman he has in custody and a cute puppy, he joins the resistance. Long story short, after a career of killing and incinerating people so they will remain emotionless drones and not kill one another and blow things up, Bale's character kills people and blows things up so society can be free to express their emotions and they all start killing one another and blowing things up. Would have been a blockbuster if better marketed.
" I have spread my dreams under your feet. Tread softly because you tread on my dreams"
I remember clearly in 2002 I saw a trailer for this movie, somehow no one recalls this movie. I on the other hand could not wait for this movie to come out, I actually went to the cinemas to see it...unfortunately it had been taken out already. Anyway, I saw it as soon as it was released on DVD; and let me tell you that when I saw it for the first time it blew me away. The Story, the Acting and the out of this world action sequences. Now 7 years later...It didn't feel the same, the movie however still stands as an exceptional Sci-Fi film, but not as superb as I remember. The problems with the movie are mainly "plot holes" some are passable and others are as big as the Milky Way. The movie's premise is of a world commencing from start after a 3rd World War. According to the brief prologue we are supposed to accept that there is only one last remaining "civilized" society, known as Liberia. In Liberia, every citizen must take a doze of a drug known as "Prozium". This drug inhibits the effect of a robotic/non emotional being. So technically speaking no one can or exhibit emotions..."why"? well according to the story of the movie, emotions like hate, greed, and anger caused War. Yet without Emotions we seize to exist as humans beings, it is an essential part of who we are. shortly in the movie we are introduced to John Preston (Christian Bale) a "Grammaton Cleric" (futuristic officer) he exhibits the persona of a man troubled by lost of someone and himself, his emotions that have been repressed are demonstrated quite well in dream sequences and thoughts. As for what happens...Its quite obvious, he accidentally lets the dose fall on the floor...And voila he begins to "feel"
So, pretty much the movie is interesting and contains a potential plot. "So what's wrong with it"? Unfortunately the problem with the movie is the plot holes. As I had said these plot holes are quite noticeable. I will write a short list of some of the most obvious mistakes. Anyhow, the movie borrows alot from Fahrenheit 451, Brave New World, and even the city looks similar to Fritz Lang's "Metropolis. Now, all of these mistakes are not to be taken as a reason to ignore this movie; on the contraire, this movie has still so much more to offer. The astonishing "Gun Kata" the technique to fight with guns blew me away, it is by far the most original idea I have ever seen in an action movie. Not one scene involving the "Gun Kata" looks bad. The best asset in the movie is Bale, he brings so much to the role, he takes the Semi-Original story and gives it heart and a push that made the film a sleeper hit. This is a sci-fi vehicle at the most, but don't underestimate the directing of Kurt Wimer (who unfortunately directed a weaker film "Ultraviolet) he directed this movie so well for so little money. The entire cast gave a little to the story so we could forget in a way the mistakes in the movie. As well the sets and wardrobe are amazing, Preston's white suit, which resembles the morning suit of Bruce Lee in Fists of Fury, Gives a certain shine to action, it pretty much gives a splendor. With its Mistakes it still worth owning, classic modern science fiction at it's best. 1) Preston at the end can somehow dodge 1,000 of bullets and still kill everyone with out a scratch. Trust me it goes on and on with plot holes...but it still has alot of heart and potential. The vest is the acting and not to mention the music, which soars so triumphantly. Too bad there isn't a soundtrack. Anyway as I said, It's a must have even if it has mistakes. At the dawn of the 21st century, society was faced with a great Third World War, and knowing that something had to be done to prevent further problems, humanity was faced with the dilemma of solving all of man's troublels. As a result, they created a new enforcer of the law, the Grammaton Clerics, a collection of warriors who practice gun kata to improve their lethality while executing their sole task of eradicating any instance of feeling within humanity. To control the general public, daily dosage of Prozium are self-administered, similar to the daily dosages of Soma in Brave New World, except this opiate of the masses elimites melancholy, rage, hate, and jealousy, as well as the suppressing positive feelings of pathos, joy, and love. Similarly, destruction of all that creates feeling, literature, art, all that gives us emotion, just like the firemen in Fahrenheit 451. Large-scale indoctrination is accomplished through the visualized, Apple commerical-esque, Big Brother screens of 1984 (used later in V for Vendetta). The combination of the three classic dystopian tales is flawless, each blending into the other, and the collective producing realism and fear for what could easily be a not-so-distant future. Two Grammaton Clerics, John Preston (Christian Bale) and Errol Partridge (Sean Bean), have worked together to "protect" society. However, Errol has been confiscating sense offender material. Eventually, John catches Errol because he had been sneaking outside of the city to commit sense crimes. When he is eventually uncovered face-to-face, John must bring his partner in for justice. His partner would rather die than be captured or give up feeling, and in a final act of defiance he quotes a passage from his book and raises his book to cover his eyes. Partridge's final words would later haunt John in a dream, as they serve as the catalyst for his finaly memory of his wife, the moment of her sense crime incarceration and eventual incineration, and he remembers with horror his still, emotionless inaction. The following morning John drops his dosage of Prozium. His sone recommends a trip to Equilibrium for a replacement dosage. Only, John doesn't go, and he begins to feel, to sense and perceive all the wonderful feelings previously unknown. Soon, he enjoys the touch of an intricately designed vase, cries at the sound of Beethoven, and risks everything by protecting a puppy from extermination. The gun battles are equisitely designed and choreographed, a little Matrix crossed with a little Jet Li action. Christian Bale delivers an impressive performance as a man who is initially wooden, and later severely troubled by his actions. At first, I thought, a Matrix ripoff. But I was wrong. There are elements of Matrix, of course. BUT..... For the informed viewer, there are also hints of 1984, Fahrenheit 451, Logan's Run, THX 1138, Aeon Flux, I'm sure I could go on. What this means is that any good NEW tale relies on the threads of classics from before. Yes, I was pleasantly surprised when I watched this movie. By all means, watch it, and enjoy. The only problem. . . with all these English speaking actors, why didn't Bale just use his own natural accent? This movie has been likened to the Matrix. A few similarities can be seen between the movies such as themes and action involved. But that's about as far as it goes. Equilibrium was all about realistic looking action choreography. To be honest this film has some of the best choreographed gun fights I have ever seen. And to my surprise and pleasure it puts anything in The Matrix Trilogy to shame. Christian Bale is one of the actors that keeps getting better and better in the movies I see him in and I am turning into a fan boy of sorts. In this movie Bale portrays a Paladin, the best of the best. Paladins are masters in the art of the Gun-Kata, a form of martial arts in which the user becomes one with his weapons and can statistically predict the trajectories and angles of return fire to maximize survivability and killing. Bale's character lives in a post WWIII society that has put a ban on emotions all emotions and a drug has been introduced to supress all emotions. Bale is void of all emotion as well and he is sent out to to remove all "sense offenders" or people who have emotions because they refused to take the drug. After missing a dose of his medication he realizes what he missed out on and begins to change his ways. Equilibrium - An Instant But Overlooked Sci-fi Classic! GoHastings is not a good seller. I love this movie. Love it. It reminds me of the older sci-fi movies like Soylent Green, Rollerball (the original with James Caan), Logan's Run, Silent Running ... or even the more modern Demolition Man. Sci-fi with a message. Fortunately for us, this one manages to cram a lot of gunfire in with that message. Some reviewers have compared this movie to The Matrix. The are, simply, wrong. There are brooding heroes in both. That's about where the similarities stop. Equilibrium is a pleasant meld of 1984 and Fahrenheit 451. In the future, feelings are considered bad. Feelings lead us to war, crime, and that which we can no longer tolerate. So, a drug is created: Equilibrium. Taken twice a day, all citizens are required to take it. To not take it is a crime apparently punishable by death. To go with the drug, all things that might cause one to feel are outlawed, classified EC-10. Our main character, Bale, is part of the police-like force, called Grammaton Clerics, that are tasked with eradicating all things that elicit feelings. Naturally, there are folks who dislike this. They like to feel. They want to feel. They need to feel. They are the rebels. These rebels hoard items of art, perfumes, music, books. The movie is about Bale's character, Preston, and his journey from unfeeling, lethal enforcer for a very dull and oppressive government ... to sense criminal and last hope of humanity. I do see a lot of 1984 in this movie. The imagery is drab, we see children enlisted to spot feelers and turn in their parents, we have a "benevolent" leader known as Father. This is mixed with the very basic premise of Fahrenheit 451: the Grammaton Clerics are tasked with destroying anything that results in feeling. Unlike their F451 counterparts, the firemen, the Grammaton Clerics are also tasked with killing anyone who feels. First off, this tendency for comparing this film to the Matrix should cease. I feel that Equilibrium is a under-rated movie and deserves more of a better rating, i was surprised to discover that this movie came out in 2002, i heard about it only last year! I enjoyed watching the "Gun Kata" fight sequences and Christian Bale kicking pretty much everybody's rear with a Katana Sword. As far as the story goes, although there is nothing ground breaking, it was directed reasonably well, without being excessively cheesy and Chrisitan Bale as usual rocks. Recommend to own. Good Movie. This film appears to have been made within minutes of the director finishing the novel 1984. The plot scheme and motifs in Equilibrium are almost identical to those found in George Orwell's classic. However, in an attempt to make the story more contemporary, this work resorted to excess gun violence and underground dealings as cheap thrills for a certain age demographic. Probably the most painful ting to watch is the acting; the dramatic stances and mundane voices just scream "Matrix" and come off as a very poor performance. The overall aspect of the film was enjoyable to watch if you don't exactly want to witness something more creative and just want the "SparkNotes" version of 1984. Like all good sci fi, Equilibrium is about the world of today, not tomorrow. How much of our souls are we willing to trade for physical security? As our government continues to strip us of our freedoms in order to "protect" us, like the Cleric we need to seriously consider what we have lost. When I first saw this film at its first release, I confess that I would have given it only maybe 3 stars. But it has haunted me over the years and when I watched it again just recently I saw so much more in it. And the action sequences, especially the famous Gun Kata, have a terrible beauty. This movie was a total surprise to me. I saw it just last night (March 2009). I somehow missed this gem of a movie. I've noticed a lot of viewers criticize the lack of realism of the Gun-Kata, and the premise of the emotions being removed, but I don't see the problem. The movie is clearly a fantasy. Nonetheless, there are some amazing scenes and some great acting in the film. The movie takes its world and characters seriously. That adds a lot of weight to the movie. The gun-kata and other fighting scenes are simply stunning. In fact, I'd say the fighting scenes are beautiful. The movie has many other moments of beauty as well. In particular, I love the scene of Bale running his hands over the contraband, trying to understand his new feelings. I also loved the moment when he tears the blinds off his window to see the world. The scene is obvious, but no less powerful because of it. Mr. Yochum's 5/6 Senior English Class. 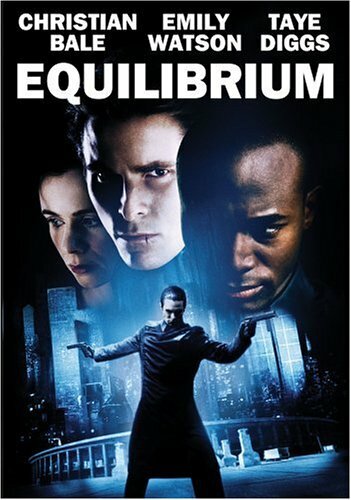 Equilibrium is an SF action thriller originally released in 2002, starring Christian Bale and set in a dystopian vision of the future where humanity lives in enforced peace, strictly controlled and enforced by a drug called prozium. The theory is that 'feelings' are responsible for war, murder and mayhem, and prozium represses these. Anything that inspires feelings, such as art, literature or music, is classified as 'EC-10' and destroyed, and those who create or hoard such items are summarily executed as 'sense-criminals'. The government's will is enforced by the Clerics, elite warriors who are trained in the art of 'gun kata', a total mastery of firearms in ranged, close-quarters and melee combat. The Clerics are tasked to seek out and destroy EC-10 materials and attempt to bring down the Underground, a rebel organisation dedicated to restoring senses and feeling to humanity. When one of the Clerics is 'turned' by the Underground, his colleague Preston becomes disturbed and starts his own exploration of what it means to be human. Equilibrium was somewhat dismissed on release for being a bit of a Matrix rip-off, with its focus on martial arts, gunplay and brooding heroes dressed in black (although Christian Bale is a considerably more intense and charismatic performer than Keanu Reeves), although Equilibrium owes a lot more to prior dystopian/utopian visions such as Brave New World and Nineteen Eighty-Four and computers do not play a significant role. Also like The Matrix, Equilibrium's premise and storyline is full of holes and if you think about it for more than a few minutes, the whole thing falls apart. Luckily, Equilibrium works better on a thematic basis, asking some interesting (if unoriginal) questions about freedom, responsibility and consequences. It is visually arresting, and the story dodges several tedious cliches and features some genuinely interesting twists along its path. The action sequences are relatively few and brief (possibly a budgetary decision), but when they do take place they are spectacularly executed. On the acting front Christian Bale, Sean Bean and Emily Watson do some excellent work, but the film suffers from weak antagonists who do not present credible threats when stood up against the murderously efficient Preston . The ending is also bemusing, as the scale of the Underground is revealed to be so vast that it is likely they would have succeeded without Preston's intervention anyway.